Yesterday, we saw how to send all notifications to iPhone using a clock Pebble Cydia tweak called BTNotificationEnabler , today we are going with a modification that promises improved battery life and also avoid being disturbed at night. DND mode is fine except it does not bother us a call is important because it is repeated several times or because they are among our favorite contacts, but some people just want to sleep well, and also if you can save battery much better. 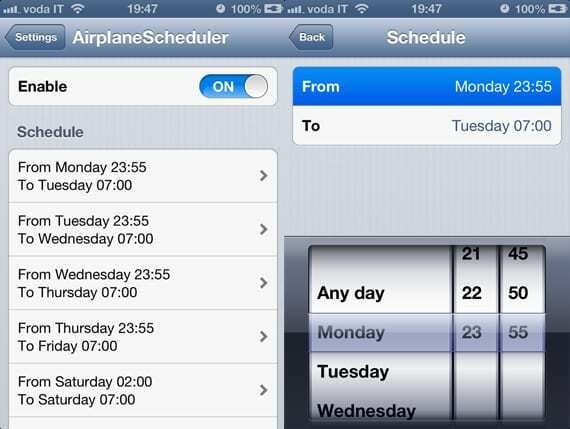 AirplaneScheduler allows us to program our iPhone into airplane mode at times we want. By doing this the iPhone off all antennas (WiFi, 3G, GPRS, Bluetooth ...) and the battery drain is minimized. Ideally, program it to automatically turn on at 1:00 (or the time we go to bed) and off again when we go to the wake. You can choose different settings for each day (not like the Do Not Disturb). This saves battery and avoid being woken notifications. You can download it for $ 1.49 in Cydi to, you'll find it in the ModMyi repo. You need to have done the jailbreak on your device. Article AirplaneScheduler: Program airplane mode (Cydia) was originally published in News iPhone .